I agree love the black! Your card is beautiful and I love the design you decided to go with . Great idea, and a fun happy card. 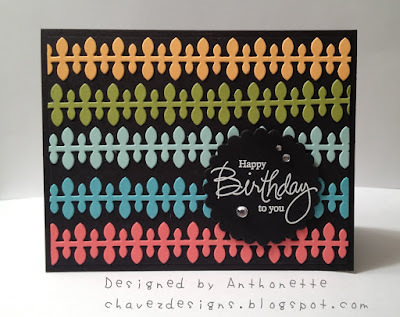 Great idea to use the same die in different colors on black. A beautiful card!!! Lovely! Those colours look great on the black background! Love how you used that die. Fabulous. This is sooo coooool! I love it! I love this card! Great colors and that is one of my favorite dies. love your rainbow of color on the black - super effect design!